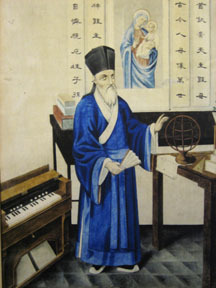 Matteo Ricci, SJ, was a missionary to China who brought his mathematical and astronomical knowledge to China and adapted to Chinese culture. Matteo Ricci entered the Society of Jesus in 1571. Along with his studies in philosophy and theology, Ricci studied mathematics, cosmology, and astronomy, subjects that would serve him well on his mission to China. In 1578 the Jesuits sent Ricci on a mission to Asia. In 1580 Ricci was sent by Alessandro Valignani, superior of Jesuit missions in the East Indies, to prepare to enter China. Ricci sailed to Macao, the Portuguese colony in South China. There he took an intensive language course mastering Chinese to perfection. Entering China in 1583 with Michael Ruggieri, his Jesuit companion, Ricci dressed first in the clothing of a Buddhist monk and then later as a Confucian mandarin. Ricci’s aim was to adapt to the customs of China to be more accessible. Ricci also brought with him Western clocks, musical instruments, mathematical and astronomical instruments, and cosmological, geographical, and architectural works with maps and diagrams. These, along with Ricci’s phenomenal memory and mathematical and astronomical skills, attracted an important audience among the Chinese elite. In 1601 Ricci was called to meet with Emperor K’ang-Hsi in Peking. He was the first western missionary so invited. For nine years Ricci and other Jesuits dialogued with members of the Chinese intelligentsia. In these dialogues Ricci sought to build a Chinese-Christian civilization. By the time he died in 1610, Ricci left behind 2,500 Chinese Catholics, with many in the educated classes. He also left behind a Treatise on Friendship, a Treatise on Mnemonic Arts, a Chinese translation of Euclid’s Elements of Geometry, a book of Chinese apologetics—The True Meaning of the Lord of Heaven, and Ten Discourses by a Paradoxical Man. After Ricci’s death certain of his decisions were questioned by Church authorities. Especially questioned was Matteo Ricci’s acceptance of Chinese ancestor worship as a legitimate, nontheological memorial to their ancestors that Catholic converts could practice. Later missionaries, not as schooled in Chinese culture, questioned this interpretation and brought their case to the Vatican. After decades of debate, in 1705 the Vatican decided that the Chinese practice of ancestor worship rites was incompatible with Catholic doctrine and was forbidden. Hearing this, the Chinese emperor banned Christian missions from China in 1721, closing the door that Ricci worked so patiently to open. Brief video biography of Matteo Ricci, produced by the Catholic News Agency in honor of the fourth centenary of his death in 1610. Blog posts about Matteo Ricci, SJ. The Chinese Rites controversy was a dispute within the Catholic Church from the 1630s to the early 18th century about whether Chinese folk religion rites and offerings to the emperor constituted idolatry. Archived article on Matteo Ricci and his contributions to science in China. The page also has many links to articles on other early Jesuit scientists, but is no longer updated.